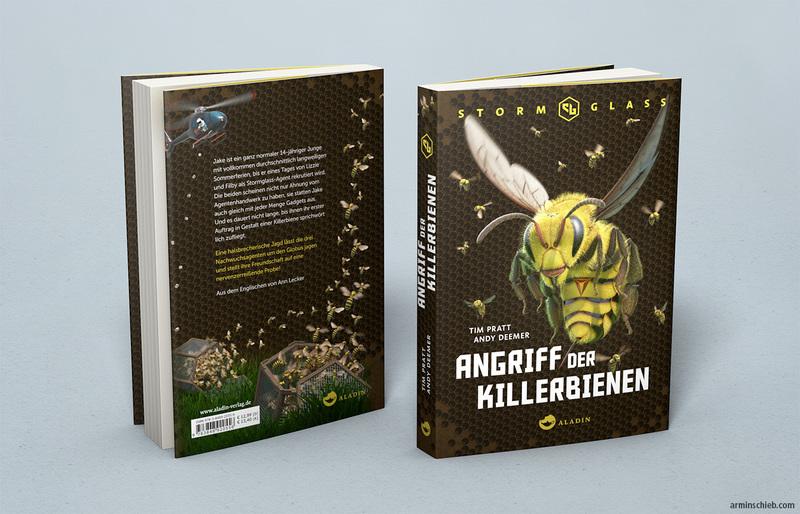 A wraparound cover I’ve made for the german edition of “The Stormglass Protocol” by the authors Tim Pratt and Andy Deemer. The book is about an artificial species of (very aggressive) honey bees. The final lettering was done by the publisher and I think it fits very well. This is how the illustration looks, before the lettering was added. Here is a quick realtime animation of the bee model. The movement of the wings isn’t supposed to be realistic, its intention is to add a bit motion blur to the tips. The greatest amount of work went into this 3D model of the bee. In its case I tried to be as accurate as possible (in a naturalistic way), while staying close to the descriptions in the book.